Special Collections is much more than the rare book and designer archive division of the FIT Library. It is a rich resource for the fashion industry and scholars of design history, including FIT's own fashion-centric graduate and undergraduate programs. The more than 3,200 titles housed in Special Collections have been vetted for their rarity or importance in the fields of fashion, textile, costume, and interior design. The collection includes 6,000 linear feet of books, periodicals, oral histories and designer scrapbooks as well as over 400 unique manuscript collections that contain more 500,000 works on paper, many of which are original designer sketches. The manuscript collections are especially strong in their documentation of American fashion design from the late nineteenth century through the 1970s, Broadway and Hollywood costume design and the history of New York City's own Seventh Avenue garment district. 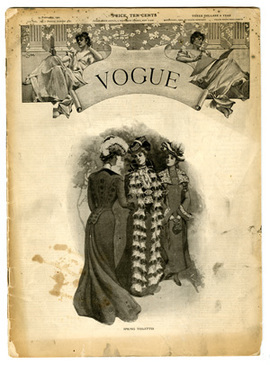 Special Collections is a highly-specialized repository of primary source research materials related to the fields of fashion and design. of archival holdings, including documents, photographs, and digital objects, at the Fashion Institute of Technology, Gladys Marcus Library, Special Collections & College Archives. New finding aids and digital objects will be continuously uploaded as they are converted from older formats or newly processed. For a comprehensive record of our holdings, please search StyleCat, FIT Library's Online Catalog.